Alcohol abuse and alcoholism are international problems whose costs economical- ly, psychologically and medically have been well documented. Alcohol is a unique drug in that the effects of excessive use can have a deleterious effect on most if not all organs of the body. The brain is one of the organs most affected by excessive alcohol consumption. Effects on the brain can be seen in cognitive function, brain structure and neurochemistry. Over the past few years, there have been significant advances made in understanding how alcohol affects brain neurochemistry. 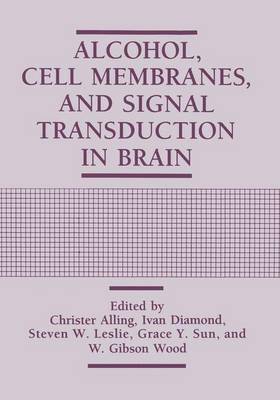 This book examines four major areas, i. e. , membrane lipids, receptors and ion channels, second messengers, and gene expression, where significant advancements have been made. The book is divided into four sections based on the four major areas. In each section, data are examined that cover a range of approaches from in vitro to in vivo studies. The section on membrane lipids includes recent developments in how ethanol affects membrane cholesterol domains, polyunsaturated fatty acids, the cause and consequences of phosphatidylethanol formation, and the modulation of membrane protein function by lipid-protein interaction. The second section comprises chapters on NMDA and 5-HT3 receptors, including new aspects on alcohol neurotoxicity and the molecular heterogeneity that may underlie differences in alcohol sensitivity as well as chapters on GABA-gated chloride flux, and calcium channels.